Following the ancient high-level route between Paro and Thimpu, the Druk Path is an excellent short trek, ideal for those who are in Bhutan only for a short duration. You will experience the countryside, mountains, alpine meadows, glacial lakes and monasteries. The first day's walk leads to the ruined Jeli Dzong which sits on a high ridge above the Paro Valley and commands breathtaking views across to Chomolhari. 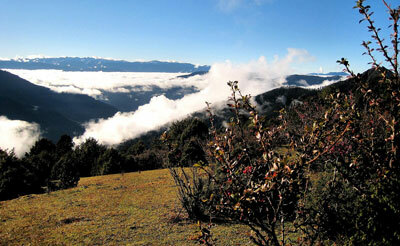 During the succeeding 4 days of trekking, we climb above the tree-line and cross several passes. En route, we camp beside clear mountain lakes, visit yak herders encampments and enjoy splendid panoramas of the peaks on the border with Tibet, including Jitchu Drake and Gangkar Puensum. We visit the ever impressive Taktsang Monastery in the Paro Valley and to visit the Tashichho dzong at Thimpu. Day 01 - Arrival at Paro Airport. Overnight at hotel. Day 02 - Day excursion from Paro to the Taktsang Monastery. Overnight at hotel. Day 03 - Leave Paro trekking to Jele Dzong (Trek starts) Overnight at tented camp. Day 04 - Trek from Jele Dzong to Jangchulakha. Overnight at tented camp. Day 05 - Leave Jangchulakha and trek to Jimilang Tsho Overnight at tented camp. Day 06 - Trek from Jimilang Tsho to Simkotra Overnight at tented camp. Day 07 - Leaving Simkotra behind we trek through Phazoding onto Thimphu (finish trek) Overnight at hotel. Day 08 - After a full day sightseeing in Thimphu we drive back to Paro. Overnight at hotel. Day 09 - Transfer to international airport for your final departure.